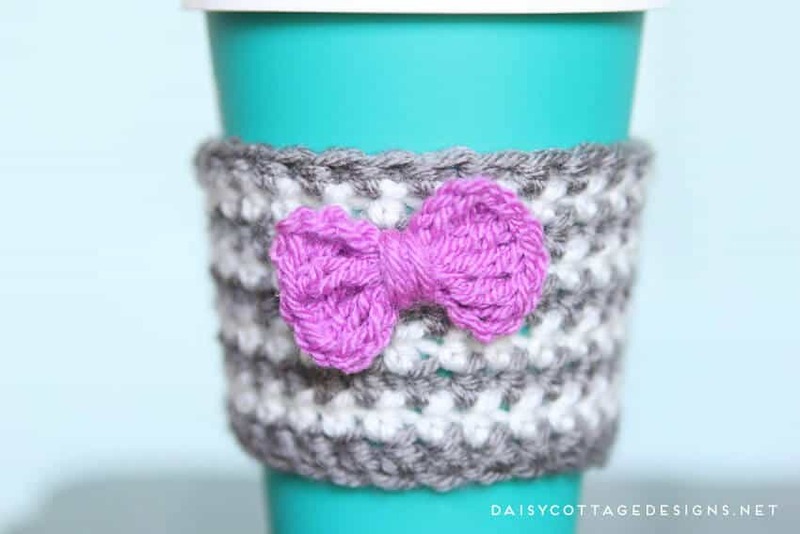 This easy crochet coffee cozy is the perfect gift for friends, neighbors, and teachers. 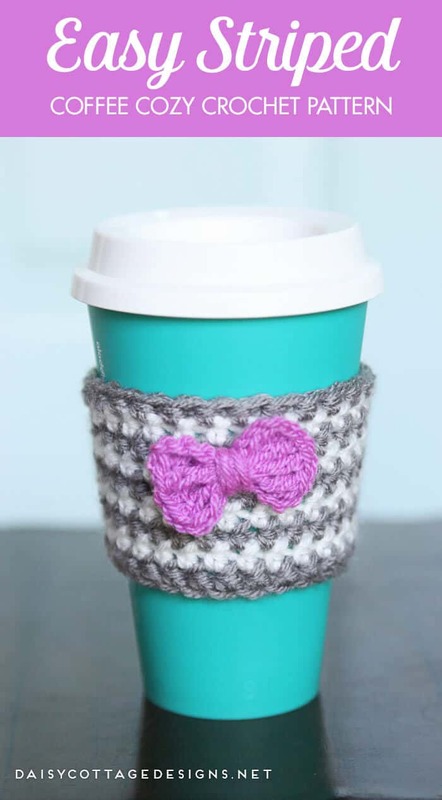 Pair it with a cute coffee cup and a gift card to a local coffee shop, and it’s a thoughtful gift that shows off your crochet skills. Add a cute bow or flower, or leave it plain. Make it all one color, change colors every row, or alternate like I did. Honestly, with a coffee cozy this simple, the possibilities are endless. If you’re new to crocheting, check out my tips, tricks, and patterns for new crocheters. This pattern is a very easy crochet pattern. It works up quickly and looks more difficult than it is. In reality, it’s very simple and so easy to make you won’t believe it. It makes the perfect beginner crochet pattern. To begin, chain 26. Compare this length to your cup (in other words, wrap it around the cup. If it’s just the right size, you’re good to go. If it’s too small, remove some stitches). Once you have the chain length just right, sl st in the first chain to make a circle. Then continue to the following rounds. Round 1: ch 1. hdc in the next stitch and in each stitch around. Sl st to the ch 1 to join. If you’re doing stripes, cut yarn and weave ends. Rounds 2 -9: Join next color yarn and ch 1. hdc in the next stitch and in each stitch around. Sl st to join. Cut yarn and weave ends. If you’re using a larger cup and want your crochet coffee cozy to be a little longer, just keep adding rows until you’re happy with the size. That’s it. Seriously, how simple was that? 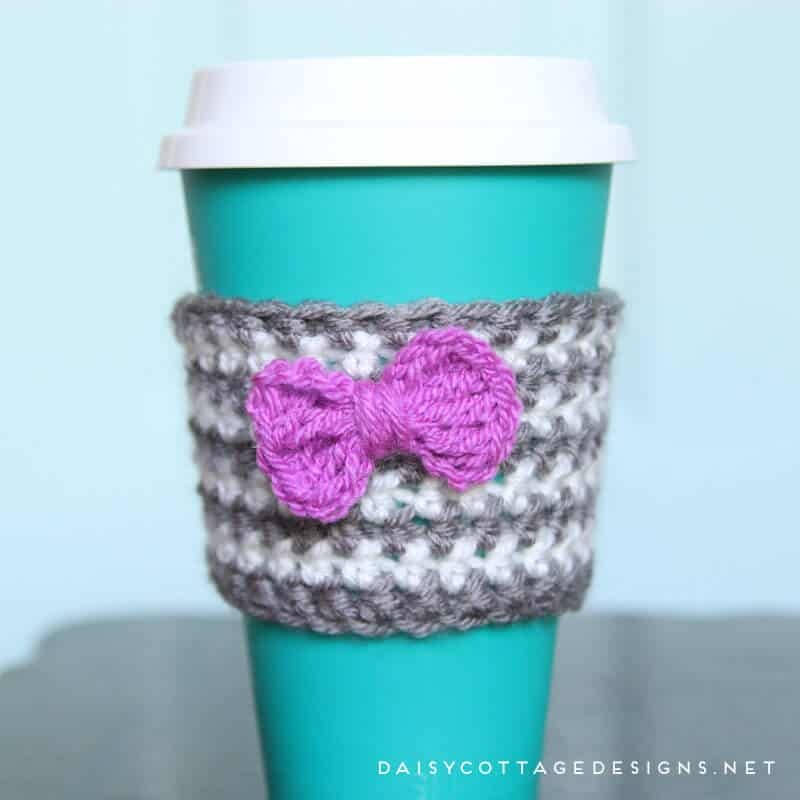 Now, you might want to embellish your coffee cozy with a little bow like I did in the pattern. If you’d like to do that, you can use this easy bow crochet pattern. Leave a long tail and sew it right to your coffee cozy. Hey. I love your crochet patterns. I have a bunch if you want them. Oh, Pam! Yarn is overrunning my house as it is! I know there are some charities that accept yarn donations!